Cecil Egermont Jackson was the 17th mayor of the City of Windsor. The achievement for which Mayor Jackson may be best remembered is the creation of a major civic space. A plebiscite in December 1927 gave majority approval to a bylaw to acquire from the Jockey Club nearly 70 acres of land (located at Tecumseh Road and Ouellette Avenue) for the purpose of creating a city owned park, sports field and education centre. In 1929, council voted to name the new park in Jackson’s honour. Jackson was first elected to city council as an alderman in 1904, then re-elected in 1905. 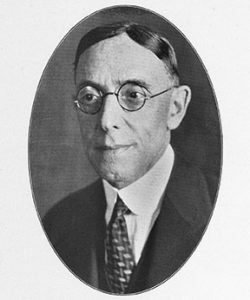 He successfully ran for alderman and held the position for the period from 1917 to 1926. In 1927 Jackson ran for mayor. He won, following an outcome contested by rival Archibald Hooper. Cecil Jackson’s early years in office coincided with boom times experienced by Windsor and surrounding municipalities during the 1920s. In Ontario, the number of building permits issued in the border cities was second only to Toronto. The Ambassador Bridge and Detroit Tunnel were constructed and opened. A new Chrysler plant began production in Walkerville, and a new hospital was erected. Jackson called for the creation of a new city hall, claiming 17 buckets were needed to catch the drips when it rained on the old building. Jackson was born on November 29, 1872 in Port Burwell, one of five children born to George and Phoebe. In 1886, Jackson’s widowed mother moved the family to our border city. The boy left school early to help support his family; later setting up his own business. A 1918 newspaper article described Alderman Jackson’s private business as “a barber parlor and billard [sic] hall on Sandwich street, where the tonsorial and recreations needs of the male element are catered to” (Border Cities Star. Oct. 3, 1918). Cecil Jackson lived to be 83 years old, dying after a lengthy illness. “Ex-Mayor C.E. Jackson Dies at 83”. WINDSOR DAILY STAR. (January 23, 1956).